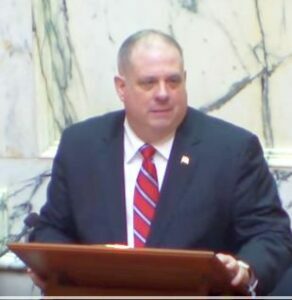 On Wednesday, Maryland Governor Larry Hogan delivered his fifth annual State of the State Address, his first since being sworn in for a second term earlier this month. The Governor, a Republican in a generally blue state spoke before a joint session at the Maryland State House in Annapolis, speaking primarily on the topics of education, infrastructure, the environment, and the center point: the economy. In his opening remarks Governor Hogan stressed “the state of our state has never been stronger and that the people of Maryland are more encouraged about the direction of our state than they have ever been.” Among the initiatives highlighted by the Governor were tax incentives and cuts, easing traffic congestion on the state’s highways and interstates, and enacting the “Clean Cars Act,” which supports clean and renewable energy sources. Mr. Hogan also said every school system in the state will see increased investment, including a casino lockbox which would provide an additional 4.4 billion dollars for Maryland schools. Of particular interest to Eastern Shore residents, the Governor discussed Chesapeake Bay restoration efforts, including the investment of 5 billion dollars into Bay Trust funds. Governor Hogan faces stiff challenges in accomplishing these goals, with the Democratic-controlled State House and Senate opposing many of his proposals, notably the increase in education funding.